Prince William says there is a link between poaching and terror, calling for "urgent action" to stop the slaughter of endangered animals. Before you blame people for killing elephants, put yourselves in their shoes. You've a family to feed, and this year, no rain to grow crops. 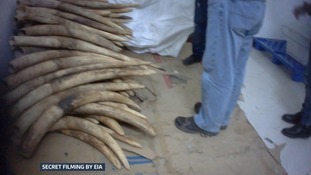 The haul, worth an estimated £100 million on the black market, came from elephants who were brutally slaughtered for their tusks. In an exclusive interview with ITV News, Prince William has issued his gravest warning yet that the rhino is close to extinction. Kerio was found dehydrated and alone in a remote part of northern Kenya three weeks ago after her mother was slaughtered by poachers. ITV News has travelled with vets in Kenya to witness their daily and often dangerous battle to save the elephant. 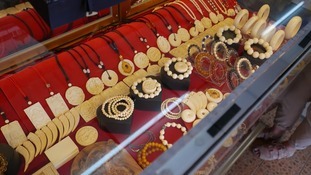 The Sang Jiang market in Laos' capital capital Vientiane has become an unofficial Chinatown openly selling ivory products. Of the rhino, a species that has graced the planet for millions of years, it is legitimate to wonder for how much longer they can survive. A look at some of the key facts and figures as elephant and rhinos remain at increasing risk of poachers in Africa.